Our “What can we carry in our Burly Trailer?” game. 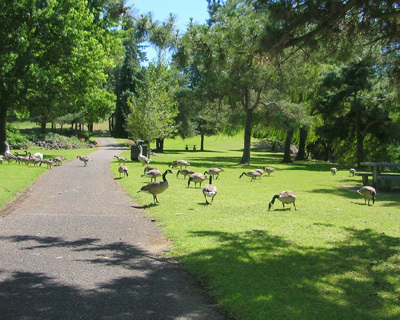 Riding the bikes on the short bike path through the Milwaukie Riverfront Park, next to the Willamette River, you are more than likely going to encounter the geese that make their home in the area. We rode through one evening last week, and slowed to allow the geese to wander off without causing great alarm. Soon the riverfront park will undergo major changes to turn the park into a multi use area. I am thinking one of those uses will not be as a retreat for the geese, they will just have to find somewhere else to live. And any slowing we will be doing will be because of the crowds, not the wildlife. This entry was posted in Portland, Or, Oregon on July 31, 2007 by golinielcomblog. Can you help with Bridge Pedal on August 12th? The Bridge Pedal is an experience! Bikes and Bridges are two of my favorite things and together, they complement each other greatly. The route is great because you ride over some bridges that can only be done during this ride. Stopping to admire and photograph the views from the top deck of the Marquam Bridge (I-5) is not something you can do anytime. Well ya, you can do it any day during rush hour, but then it’s not a good idea to actually get out of your car in the midst of the stalled traffic, and you are likely not in the mood to admire the view. So, then this is the day. It is a hugely attended ride, which can make actual bike riding a bit more of a challenge, so you just have to be prepared for that. If you don’t want to ride, then volunteering is a good activity choice for the day. Here’s the word, direct from the BTA….. Volunteers are supplied with water, juice, snacks and a free BridgePedal tshirt. Plus, you get to ride free next year if you want! BridgePedal is a benefit for the Bicycle Transportation Alliance, raising thousands of dollars for our work on good laws, lanes, paths, education, streets, parking, and classes that get more people biking more often. Each volunteer represents a contribution of $300 to the BTA – that’s huge! Besides that, BridgePedal is a chance for people who don’t normally get around by bike to reconnect with the joy of riding a bicycle in the city, and we want everyone to remember what a great feeling that is. This entry was posted in Bicycling & Fitness on July 27, 2007 by admin. This could be a fun time, or it could be …… kinda weird. This bicycle Ride will help to support the great work that the Community Cycling Center does for the kids in the Portland/Vancouver area, so that in itself makes it a good thing to do. It looks like its going to be a great day for biking in Portland. Here are some reasons to do this ride. You decide if any of them sound good. * Beer for sale at the finish line ! This entry was posted in Bicycling & Fitness on July 26, 2007 by golinielcomblog. The Open House will the the third public event for the Sellwood Bridge project will be held on Wednesday, July 25, 2007 from 6:00 to 9:00 p.m. in the Sellwood Middle School gym. Presentations will be held every 45 minutes to provide a project update, explain the results of the alternative screening process, and get the public’s input on the remaining alternatives. Detailed information about the alternatives which have been advanced for further study will be available as well. Take a survey at the open house or online (from July 30 through September 9) to provide input about these alternatives. If you can’t go to any of the open houses at least sign up for the mailing list list to receive regular project updates. Here is some good information on alternatives. To me, the alignment chosen for the new bridge is secondary to the cross-views of bridge width. I would hope that we accept nothing less than a 4 lane road, with walkways, AND bike lanes on each side. I have heard the arguments that 4 lanes instead of 2 will increase traffic, but I do not buy it. The traffic will go where it needs to go, and people will not make a decision to go a certain way based on the number lanes. They base those decisions on time and distance. As we can see, the 2 lane bridge backs up and adds time, but it is still used. Isnt it better to have more cars travel with better traffic control, than less cars, travelling in jammed conditions? The bridge just has to have safe bike lanes!!! This entry was posted in Spanning the Bridges on July 25, 2007 by admin. Every winter, our opportunities to ride and workout seem to go down in proportion with the amount of food available to eat. And then summer comes and we begin to bike much more. It is then that we run in to the delicate balance between eating enough to fuel our extra caloric needs, while keeping the intake down to a level where we can shed the winters damage. Heres some tips that can help maintain that balance. 1. Skipping breakfast. Not eating breakfast is like asking your car to get to work without any fuel in the tank. Experts agree – skipping breakfast just means you’ll be hungrier later, which can make it more difficult to control both your diet and weight. 2. Not eating before a workout. Providing the body with food for energy allows for a better, more productive exercise session. A pre-workout meal consisting of carbs, a little fat and some protein can also help improve endurance and hand-eye coordination. 3. Waiting too long after exercising to eat. One of the best things you can do to prepare for your next workout is eat a small meal that includes both carbohydrates and protein within two hours of your last session. The carbohydrates help replenish muscle glycogen stores and the protein facilitates the repair of damaged muscle tissue. 4. Replacing meals with energy bars or replacement drinks. Sure, they’re convenient, but too often energy bars offer little more nutrition than your average candy bar. Replacement drinks may lack adequate fiber. When it comes to eating nutritiously, there’s really no substitute for healthy foods. 5. Not consuming the right amount of calories for the amount of activity you do (i.e., too many or too few). Your caloric intake should be sufficient to support your active lifestyle, but not so abundant that weight control becomes a challenge. 6. Not drinking the right amount of fluids. Dehydration can be a serious problem, especially if you exercise in hot, humid environments. Drinking fluids before, during and after exercise will help you maintain adequate hydration levels. Just don’t take it to extremes – drinking too much may result in sodium deficiency, which, though rare, can also pose a danger to one’s health. This entry was posted in Bicycling & Fitness on July 20, 2007 by admin. The presentation below is being hosted by Metro. Why People Aren’t Cycling (and How to Help Them Start): What new focus group and poll information tell us. Presented by Linda Ginenthal, Program Manager for the City of Portland’s Transportation Options department. If you have questions, please contact Julie Cash at Metro: (503) 797-1644. This entry was posted in Bicycling & Fitness, Portland, Or, Oregon on July 20, 2007 by admin. Jim Caple has a list of reasons why you should love the Tour de France. The list applies to biking in general. I especially liked the last one. Which is the biggest reason I love the Tour. Most of America’s most popular sports are enjoyed only from the couch. Not biking. No matter your age or weight, everyone can bike — and should. It’s fun, and a good way to get around — the extra time it takes to bike somewhere is easily made up by the time you save not looking for a parking space or going to the club for a workout. More importantly, it’s good for you, good for the environment and good for the country. Who is more patriotic, the person who commutes to work on a bike, or the guy who slaps a U.S. flag decal on his SUV that gets 12 miles per gallon? So turn on the Tour during the next three weeks and start riding your own stages. Once again feel the joy you enjoyed as a kid while you pretend you’re breaking away from the pack on Col d’Aubisque. Trust me, there is no greater pleasure in sports than passing SUVs stalled in rush-hour traffic. Unless you’re passing them as they fill up at the gas station. This entry was posted in Bicycling & Fitness, Social on July 19, 2007 by admin. These gutters are for bikes, not for rain. So, we were giving the family a tour of the city, which included a tram ride up to OHSU and while we are admiring the view, I spot the bike gutters. Quizzing the family on the use of this feature solicits vague answers about water management. Well, at least they are Oregonians and know the need for handling rain. But, they are definitely not bike riders and they are not from Portland. Most any rider of the city who has had to navigate stairs, or find a ridable path up and around them should instantly recognize them, and give silent thanks to the designers who had the foresight to plan for them, and the bill paying body that agreed to pay for them. 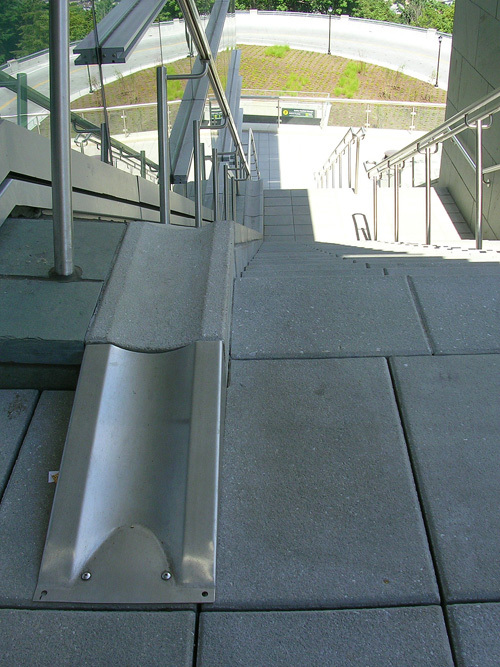 The bike gutters are great for pushing your bikes up the stairs, or letting them glide silently down without having to bang them on each stop. Not having to carry the bike up the stairs is particularly helpful when you have a load of some kind on the bike. Ok, carbon bike owners scoff and smugly carry their 18 pound bikes one handed down the steps. Let them be smug, this is still one more kind of thing that makes Portland a (relatively) bike friendly city. This entry was posted in Bicycling & Fitness on July 18, 2007 by admin. Planning Our 2007 Tivo Season Pass. The pilots for most of the new TV shows to 2007 are still a month away, but it is time to start updating our Tivo Season Pass. Earlier we looked at our existing 2006 Season Pass. We are now beginning to clean up and re-prioritize the shows we will continue to watch in order to make room for the new additions. We have looked at some of the early reviews available all over the web, and drafted a preliminary list of shows we may be interested in. This list will grow, as the season nears as more information is available, and our scope widens. Our strategy is to include all the shows that we may want to follow, so that we can get in from the start, knowing that there are several shows in the group we will drop very early. You should be able to determine whether you will want to follow a series, within the first 1 to 3 episodes. Sometimes you know during the very first show, sometimes you want to give them a little chance to develop into something interesting. If we can’t decide by the 3rd show, then we give it up just because we don’t have the time to let a mediocre show drag on. So, here are some of the shows I will be adding to our Tivo Season Pass. We will have to wait to add most of them until they start to show up in the schedules, so I need to check in each week to see if they appear in the search list. No reviews here, look elsewhere for that. This entry was posted in Tivos & Other Technology on July 18, 2007 by admin. gender gap to make rides safer. You don’t have to be a cyclist to guess the scariest places to ride a bike in Portland. Danger zones include the controlled chaos of downtown, the high speeds of the outer Eastside and the winding uncertainty of the West Hills — all places where drivers and cyclists mix with unease. There’s a way to measure bike safety beyond guessing, however. Watch for women. As the city’s bike planners have found, there’s a direct correlation between the safety of a particular area and the number of women cyclists. The city can use this information as it maps out a new master plan for biking, reduces the danger spots and strives to spin its “gold” rating from the League of American Bicyclists into platinum. also more likely to cite their reluctance to ride near traffic as a reason for staying off their bikes. This entry was posted in Bicycling & Fitness, Portland, Or, Oregon on July 18, 2007 by admin. Environment Oregon helps pass important bills in 2007 legislative session. When the Legislature adjourned from Salem a few weeks ago, Envionment Oregon concluded the best legislative session for Oregons environment in three decades. Environment Oregon passed, or helped pass, bills to increase our use of renewable energy, reduce global warming pollution, expand recycling in Oregon, protect Oregons great outdoors, and clean up toxic water pollution. As they plan work for the coming months, you can let them know what you think are the most important issues to be working on. The cornerstone of their agenda was the Renewable Energy Standard putting Oregon on a path toward 25% renewable energy by 2025, which will move us toward energy independence and global warming solutions. They also passed several bills to spur energy conservation and greater use of solar power, and a bill establishing targets for reducing global warming pollution in Oregon. The Legislature also enacted both of the top priorities for recycling: expanding Oregons Bottle Bill to put a 5-cent refundable deposit on water bottles, and creating a free and convenient program for Oregonians to recycle computers and TVs. Also passed several bills to protect Oregons outdoors: a bill that puts a moratorium on offshore oil and gas drilling on the Oregon Coast, and a bill that asks voters to approve reforms to measure 37 and protect Oregons forest and farms. As well as two important measure for cleaning up Oregons air and water: a toxic water pollution prevention bill and increased funding for the Department of Environmental Qualitys implementation and enforcement of clean air and water laws. This entry was posted in Portland, Or, Oregon on July 16, 2007 by admin. My blueberry netting has done its job, think they are ready to pick. The plastic mesh netting with the bamboo stake frame has done its job. No sign of those pesky birds. Our berries are now ready to pick.This is our year to be the early bird. This entry was posted in Portland, Or, Oregon on July 15, 2007 by admin.